One has to stop to think about the variety of elements that go into a landscape with the Mediterranean climate of San Diego. A homeowner can implement his or her personal choice of styles, for example, Rustic vs. Formal, Contemporary or Traditional, English, Japanese, Southwest, Mediterranean, and so forth. Then within those styles a designer can then add factors such as a tropical theme compared to a Xeriscape (Water-Wise) based plan. Using California native plants in lieu of the vast variety of plants imported from other regions like Australia, South Africa, Chile, Europe. And the soft-scape (plantings) are only a small part of the overall plan. A landscape in San Diego has a greater importance as these outdoor spaces are intended to be used in all four seasons. Therefore, homeowners do opt to use more elaborate materials. With such a strong influence of our Spanish heritage, intricate Spanish tiles and Saltillo tiles or more commonly found here. Even porcelain tiles can be used in a outdoor setting. Enjoying the landscape year round has led design to evolve into the creation of actual outdoor rooms, some built with a solid roof, others with open skies and walls, fences or hedges to frame views and create privacy. Typically the selection of these hardscape elements are an extension of a home’s architecture itself. Landscape Design in San Diego does have its other challenges as the cost of water and climate change are affecting outdoor spaces. In the past, one did not have to suggest varied options in place of greenery. So today, more gravel, cobble or decomposed granite is more prevalent. The need for shade structures is so strong as more and more people are avoiding the sun. To really enjoy an outdoor event such as dining, the setting does need some protection from the heat of the day. Most people can’t wait for a shade tree to mature, so other elements such as fabrics, shade cloth and shade sails are more commonly used today as well. And lastly creating a landscape in San Diegos implementation. When a landscape is well designed and well built, it can last a lifetime. Of course, maintenance is always a critical factor in any elements longevity. 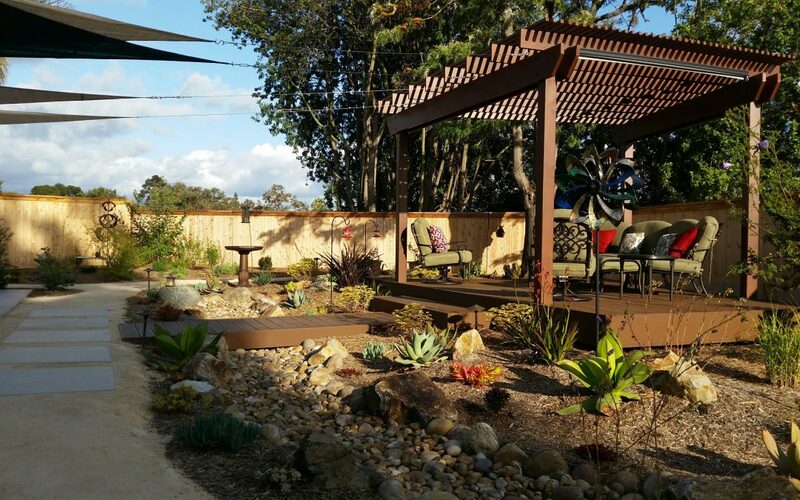 Letz Design has created hundreds of landscape designs in San Diego over the past 15 years. Contact me at any time to get more ideas for your own unique outdoor space.